I’ve finally recovered enough from my gum surgery to post again. Thank goodness, because I almost missed blogging about Hannukah! 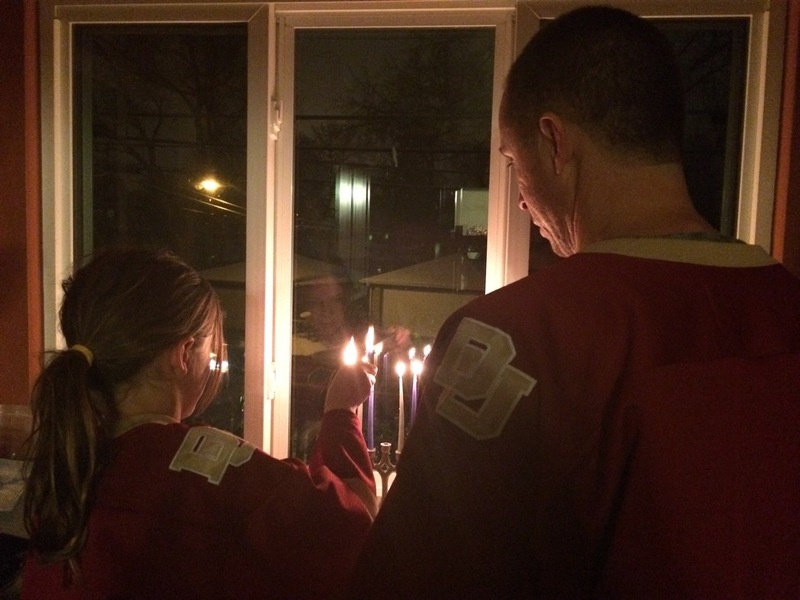 Mr. Afthead and our daughter lit the candles before leaving to watch the University of Denver hockey game tonight. (I wasn’t invited because I’ve yet to stay awake past 9:00 since Thursday’s surgery). We don’t do any presents for Hannukah, so the tradition is just about lighting the candles. Mr. Afthead’s father is Jewish, so we aren’t: Judaism is passed on through the mother’s side. Our celebration is cultural and not religious. As someone who didn’t grow up with this celebration, I have grown to love the moments of quiet calm for eight nights during this busy season. It’s also a touch point every year to measure how much my daughter has grown: this year she can light the candles from the middle candle, the shamash, and recite the prayer herself, in Hebrew. By next year she may be able to even light the shamash herself. Happy Hannukah to any of you who celebrate and happy holidays to everyone from the Afthead family! Glad you explained that because I thought I missed the Jewish part of your identity for a moment. Happy Hanukkah!